The animated television series The Clone Wars has created a rich and believable relationship between Anakin and Ahsoka, and now that it is in season three, it is becoming hard to remember what things were like before Ahsoka. In the Original Trilogy, Anakin Skywalker was a mere whispered name and the ravaged, unmasked Vader did little to conjure images of what the great Jedi might have once looked like. With the prequel films, George Lucas brought that young Anakin to life, even going so far as to show what Anakin was like as a child. Yet the relationship established in the Prequel Trilogy was one between Anakin and Obi-Wan. This same relationship was one of the core factors of Dark Horse’s Republic series. 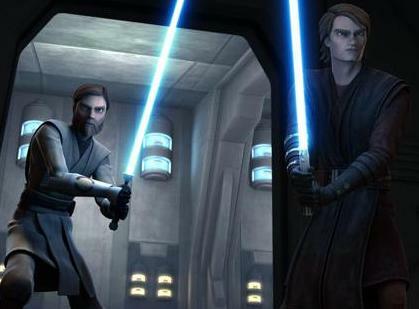 However, with the introduction of Ahsoka, the relationship between Anakin and Obi-Wan has changed, and the question is: has the change hurt or helped the Expanded Universe? First off, let us look at what Ahsoka has done for The Clone Wars. One of the key elements of any show is the cast. With the Clone Wars era of Star Wars, the stars have always been Anakin Skywalker and Obi-Wan Kenobi. 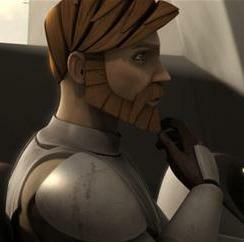 As illustrated by the Republic comics and various other elements of the EU, they are the very heroes of the Clone Wars. 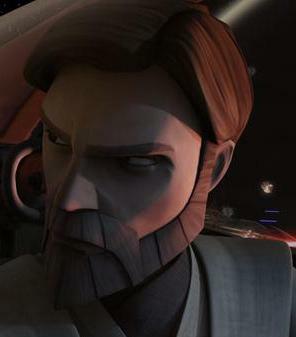 However, a television show constantly following Anakin and Obi-Wan would present limited options for storytelling. Furthermore, the subtle change up of pairing them with other Jedi, while introducing more options, would still fall short of the longevity needed for a successful show. Yet Ahsoka not only provides a solution, but brings in a breath of fresh air. Ahsoka’s addition to the cast as Anakin’s apprentice opens up the storytelling aspect threefold. 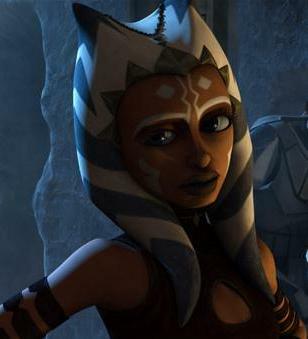 On one hand, Ahsoka is a new unexplored character. On another, there is the new element of her relationship with Anakin and how it fits with his existing relationship with Obi-Wan. Finally there is the added option of the series now being able to toss Obi-Wan, and even Anakin, in and out of the episodes. In a way, Ahsoka becomes a new fulcrum for the series to stand upon…when needed. Regardless of the extra storytelling options, Ahsoka has become a full-fledged character in her own right. Like Jar-Jar, she was met with initial criticism, however, she has also been much more successful in overcoming that initial criticism. That acceptance is essential because it has strengthened the importance of her bond with Anakin. With the popularity of the series, a whole host of new viewers are being introduced to this dynamic duo. The emphasis placed on Ahsoka and Anakin would normally have forced Obi-Wan out of the limelight, yet the show somehow has managed to avoid this. Rather than turning Obi-Wan into a third wheel, he has become the overseeing master of both of them, almost like a Jedi supervisor or chaperone. Between the three of them, they have created a new dynamic that works and maintains the importance of each character without diminishing their roles. To the established fans, the most important factor is how the relationship between Anakin, Ahsoka, and Obi-Wan affects the films, and to a lesser extent, the rest of the expanded universe. Since Ahsoka’s fate is unknown at this point, a discussion of why Anakin never mentions her in the films is premature and it may turn out to be an easy retcon. Nevertheless, the fact that Anakin formed a master-apprentice bond with Ahsoka does jeopardize the importance of that same bond with Obi-Wan. However, since Obi-Wan never really leaves the picture, and is a fairly constant companion to Anakin in The Clone Wars, there is never any weakening of that relationship. In fact, the way it turns out, it helps change the master-apprentice role between Anakin and Obi-Wan into the brother-like role they have in Revenge of the Sith. 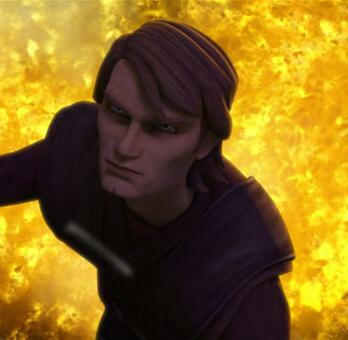 By giving Anakin an apprentice, it eases the focus on Obi-Wan the teacher and shifts his role more toward Obi-Wan the equal. Of course Obi-Wan still slips back into the role of teacher often enough, but there is still that slight elevation in status that lets Anakin strengthen that bond of brothers. In the end, Ahsoka’s greatest accomplishment might be giving truth to Obi-Wan’s line in ROTS, “You were my brother, Anakin.” Thus I think the introduction of Ahsoka has the potential to not only help the EU, but to strengthen it. Feel free to share your feelings on the subject in the forums. First of all, everyone here at Roqoo Depot is tremendously saddened by the tragic earthquake that has devastated Japan over the last couple of days. Our hearts go out to the Japanese people and anyone who has friends or family affected by this horrific natural disaster. We would urge anyone who is able to make a directed donation to your relief organization of choice or you can donate via SMS by texting the word “REDCROSS” to the number 90999. While Roqoo Depot is first and foremost a Star Wars fan site, we also strive to bring our readers the best in real life science and space exploration stories as well. There has been a lot of rumor and scattered news reports about the effect this earthquake has had our planet itself. I have been listening to news reports and doing research on the internet since early yesterday trying to get to the facts. I will share some of those with you here in this column and while the sources I’ve checked are too numerous to mention all of them, the very best source and explanation I have come across as I dig through the various news sites and blogs available on the web and television comes from one of my favorite web sites of all time, Space.com. If you click the link you will find an excellent article explaining exactly what happened to our fragile planet and how it will effect all of mankind as we continue to spin around in circles together on this little blue space marble we call home. It is true that the entire nation of Japan has shifted it’s mass by approximately eight feet. Also true is that the Earth has shifted it’s axis by about ten inches. The result is that the length of an Earth day has now gotten shorter as the shifting mass of the planet has caused the rotation to pick up speed. In much the same way as a figure skater increases their speed of rotation during a maneuver by drawing their arms in toward their body, so has the planet drawn ever slightly in on itself, increasing it’s rotational spin. The length of the average day has now decreased by 1.8 microseconds. A microsecond is one millionth of a second. This isn’t the first time this has happened. In fact many factors contribute to minor changes in the speed of the Earth’s rotation all the time. Other seismic events, the jet stream and the changing of the seasons can all have a far more pronounced effect on planetary spin than this earthquake has had. 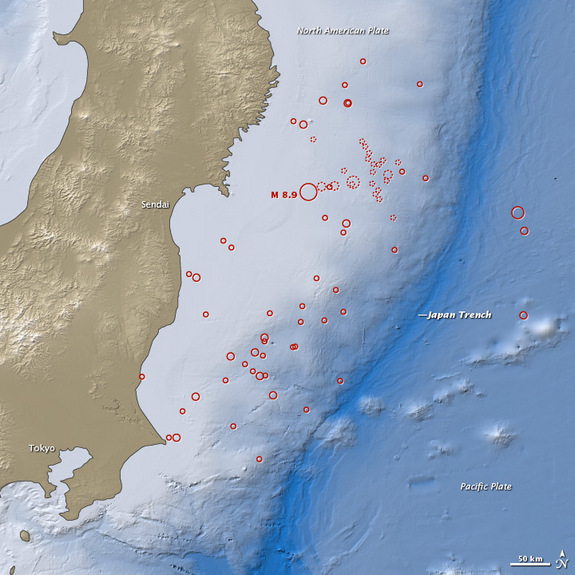 In the last hundred years there have been other, larger earthquakes that have had a much greater effect. It is largely believed that the result of this shift in the Earth’s mass will be imperceptible to anyone inhabiting the planet and it is not expected to have any significant impact on global temperatures or regional climates. You can discuss this story in our forum by clicking here.